Did you know that many employers match funds donated by their employees to Wat Buddhanusorn? That means your $500 gift could become a $1,000 gift. Make your gift go even further with your employer’s matching gift program. Find out how you can best leverage your gift and help support Wat Buddhanusorn charity. Many companies support and encourage charitable giving by matching employee gifts to US 501(c)(3) nonprofits like Buddhanusorn. Apple, Google and Ford Foudation just added Buddhanusorn in their systems. Check to see if your company will match your donation! What are Employee Matching Gifts Programs? Employee Matching Gifts are donations an employer makes to match its employees’ charitable contributions. Usually associated with corporate grantmakers, employee matching gifts often are dollar-for-dollar, but some companies will give double or even triple the original donation. Matching gifts are free money that employees often overlook. Corporate matching gift programs are a simple way to double employees’ donations to eligible nonprofit organizations. Many companies already have these programs in place, but most employees don’t take advantage of them. Don’t let easy, additional funding slip away. Each company has its own guidelines for employees, spouses, retirees, and widows/widowers. Most corporate procedures are very simple. Talk to your human resources department to obtain a form and guidelines or to find out if your company have a Maching Gift Program. Have a general question about making a gift donation? Please contact your Human Resources department to find out if your company participates in a matching gift program. 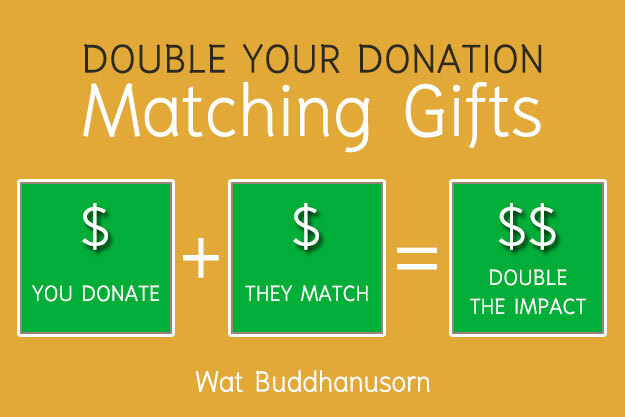 If you have questions regarding matching a donation made to the Budhanusorn, please contact our Treasurer at (510) 468-2546 or email to donate@watbuddha.org. Note: If your company isn’t listed here, talk to your human resources department to find out if they have a matching program.